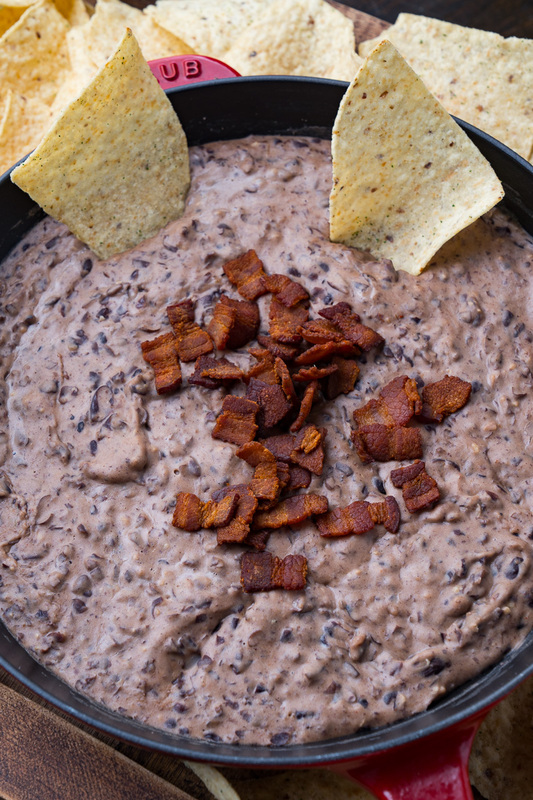 A hot and creamy black bean dip with plenty melted cheese and bacon! 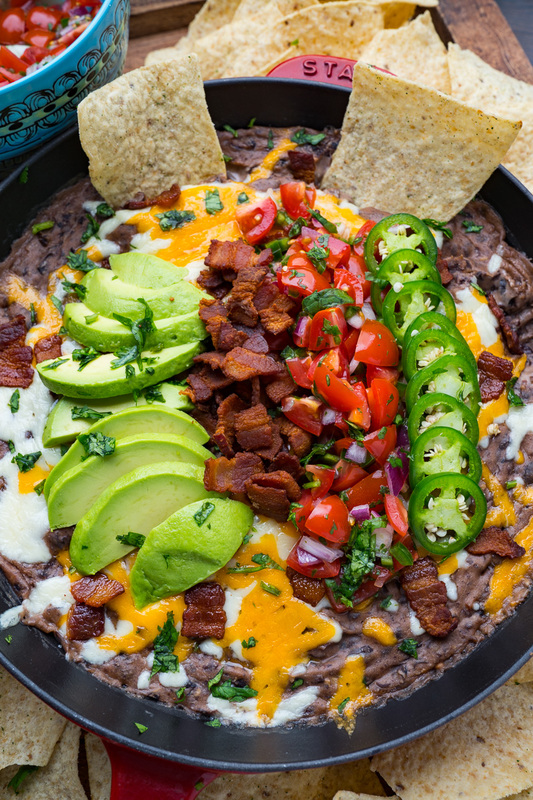 Bean dip is always a hit for snacking while watching the big game and this cheesy bacon black bean dip is my favorite recipe! It starts out with bacon! It’s cooked until it’s crispy and then the bacon grease, packed with all of it’s bacon-y flavour, is used to cook the onion, garlic and spices. (The spices include some smoky chipotle chili powder along with cumin.) I like to use canned beans for convenience and after they are warmed everything is pureed in a food processor, or mashed, before the cheese is added and allowed to melt into the dip. The bacon is then added before everything is topped with even more cheese and placed into the oven until the cheese has melted! Yum! I like to top this dip with fresh ingredients pico de gallo, avocado, jalapenos, green onions, sour cream, etc. ; pretty much making it an easy seven layer dip! 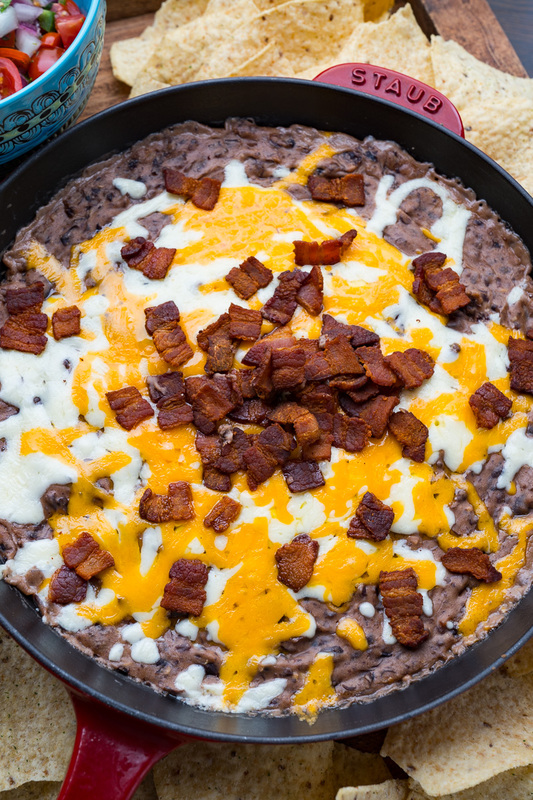 If you are looking for that one snack to serve while watching the football game this weekend, you really can’t go wrong with this cheesy bacon black bean dip! 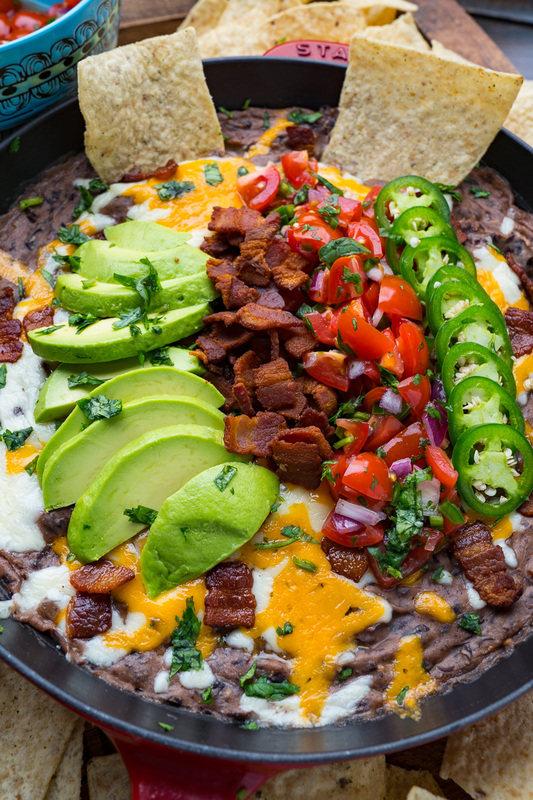 Is this the perfect tailgating recipe? Make it ahead of time and simply warm it up at the tailgate party! Cook the bacon in an oven safe skillet and set aside to cool before crumbling, reserving 2 tablespoons of bacon grease in the pan. Add the onions and cook in the reserved bacon grease over medium heat, until tender, about 5 minutes. Add garlic, chipotle chili powder, and cumin, and cook until fragrant, about a minute. Add the beans and water and bring to a boil before mashing with a masher or pureeing in a food processor. Return to the pan, add the monterey jack cheese and cook until it has melted into the bean dip. Mix in the bacon, sprinkle on the cheddar cheese, and transfer to the oven to broil until the cheese has melted, about 1-2 minutes. Option: If you are not using bacon, cook the onions in 1 tablespoon oil. Note: Add extra water to get to the desired consistence. Option: Use 3 cups of cooked cooked dried black beans instead of canned. Option: Mix 4 ounces of cream cheese into the dip for an even creamier dip! Option: Mix 1/2 cup salsa into the dip! Option: Top the dip with you favourite fresh ingredients like pico de gallo, avocado, jalapenos, green onions, sour cream, etc. Tip: Leftovers are best warmed. 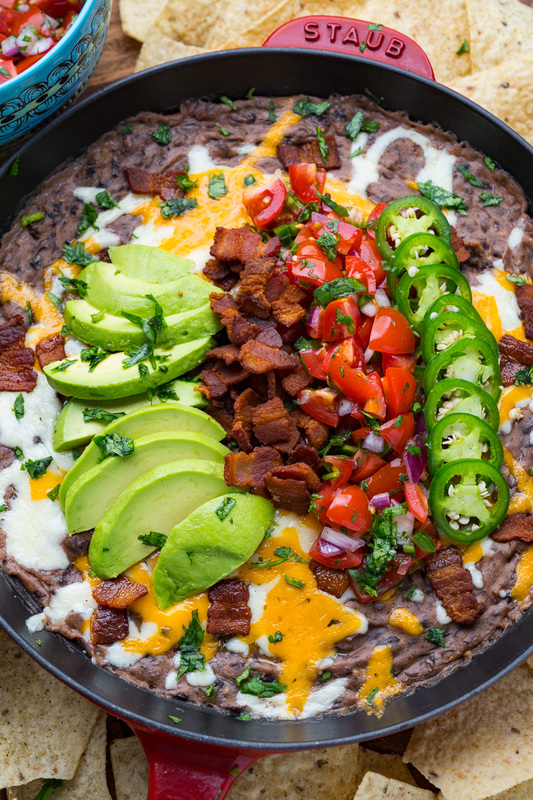 This dip looks amazing as everything is better with bacon. Time to put this on my weekend list to try for the family.